After getting my Kraken my first stop was visiting my local Jackson Kayak Dealer, OEX, to get some rigging done. Sure I could do it all myself but they have all the tools and parts I needed to make it a fast and easy job. 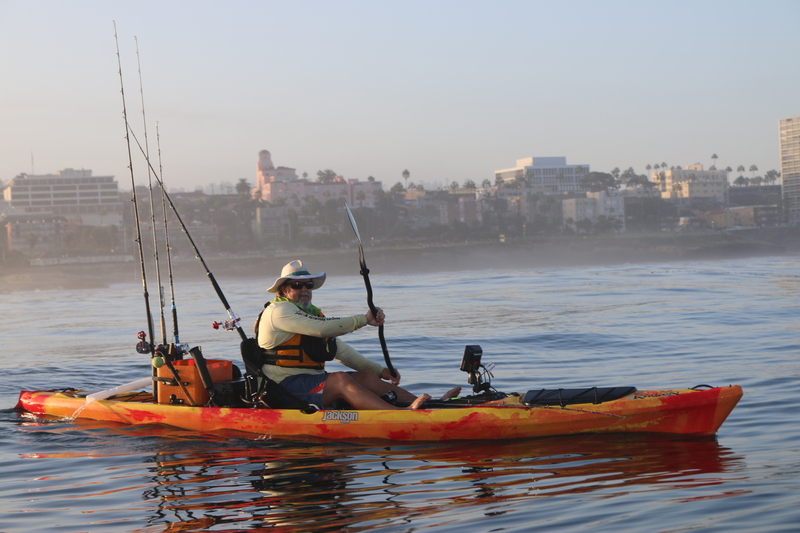 The Kraken was designed to be easy to rig for fish finders and turning the included KKrate into a bait tank. 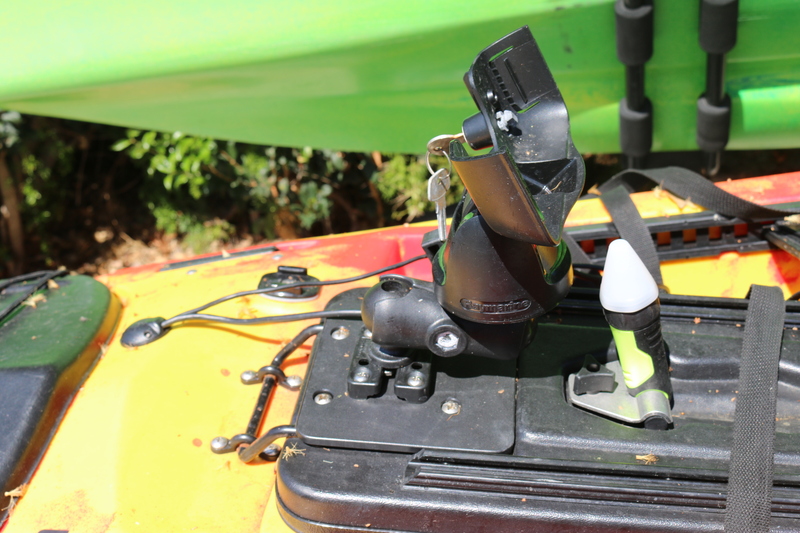 Below I will give you a quick photo walk through of how we rigged up my new Kraken with a Raymarine Dragonfly fish finder. The first job was deciding the position of my Raymarine fish finder and how to mount it. 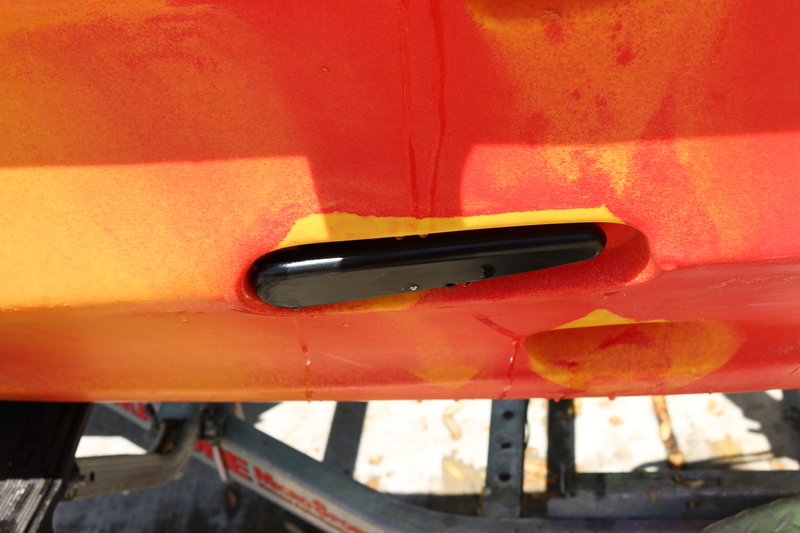 I decided to put it onto the center hatch attached to the piece of starboard which covers the hinge. I like to keep it so that I can take the entire finder base off, this keeps it from getting damaged when carrying a bunch of boats. I used a combination of a Yakattack Mighty mount and some Ram mount parts to mount the base. Raymarine Dragon fly base attached with a Mighty mount and Ram parts. We ran the power and transducer wires through the hull just in front of the hatch. The next step was setting up the transducer and running the wires to the battery and the head unit. 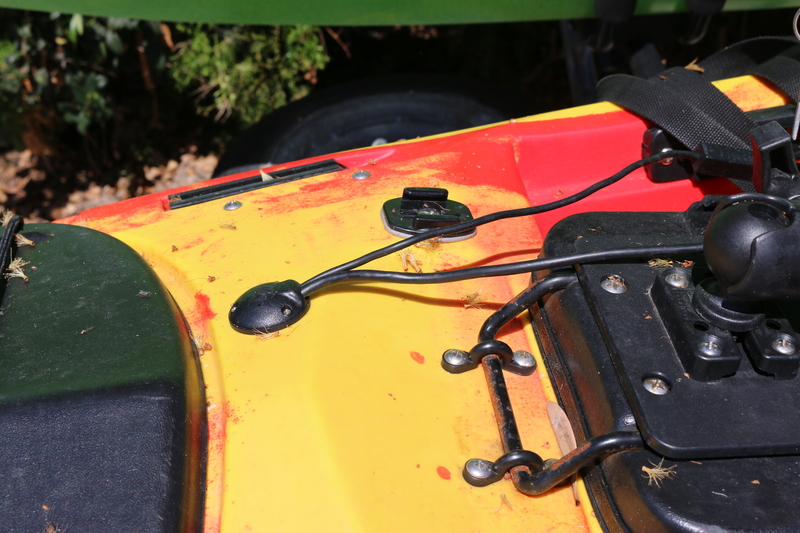 To secure the Transducer we used a disc of plastic that came from a flush mount install. Just cut it to size and put a couple holes in it. Run a piece of cord though the bolt hole at the top of the transducer then up through the Transducer scupper and through the disc. We used a small cord lock to hold it is place. A cheap and easy transducer mount. 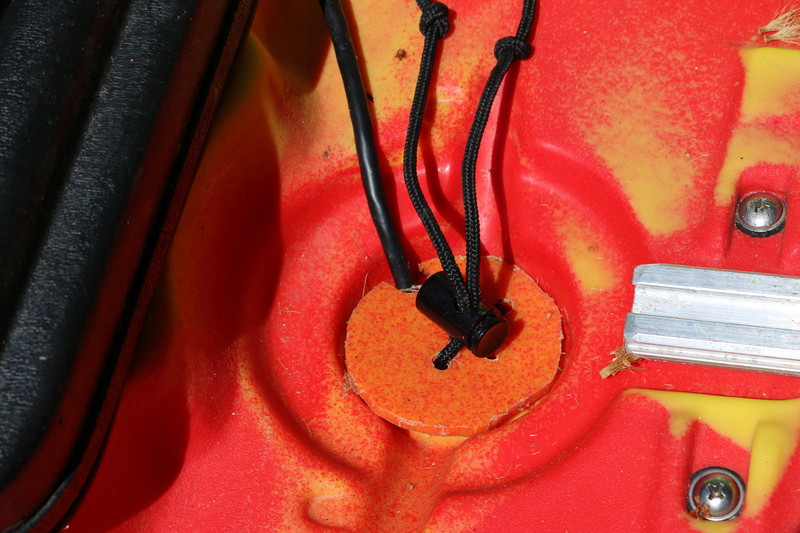 The Transducer pulls up nice and snug into the bottom of the boat. Transducer cable run through the hull in the side of the center hatch. 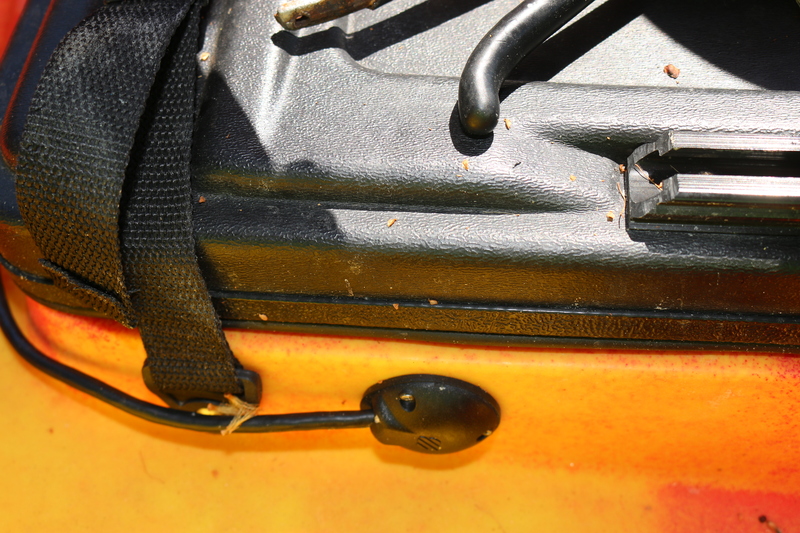 With the included battery tray in the Kraken your battery sits nice and secure off the bottom of the kayak. 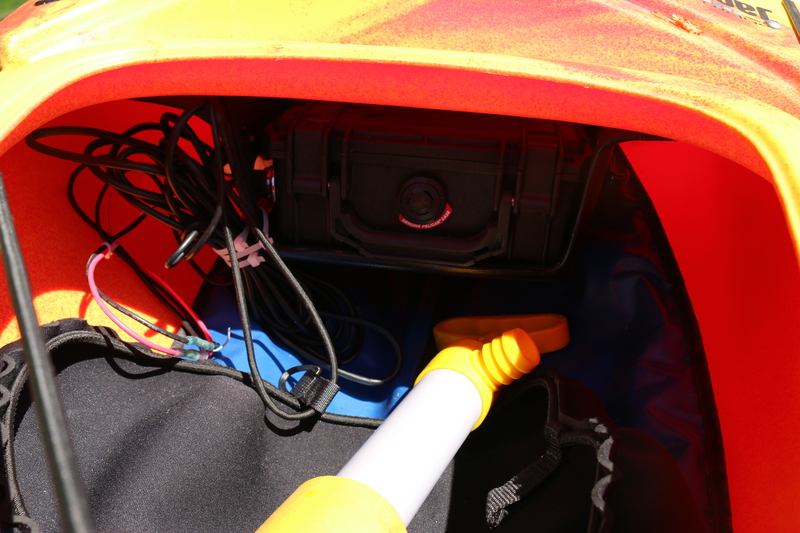 I used a KFS watertight battery box with external connector as my power supply for both my finder and my bait tank. The KFS battery box fits perfectly into the Kraken battery tray. In part two of the Kraken rigging I will show you how we rigged up my bait tank. ← Some Kraken on the water shots.